WIT Arena High Performance Unit is a state of the art weight training facility. WIT Arena’s High Performance Unit is a state of the art strength and conditioning facility. 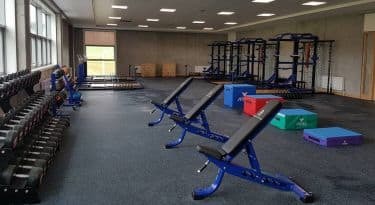 The high performance gym was built to provide special provision for elite athletes and teams, both professional and ambitious. It is an exclusive training area equipped with functional, specialised equipment that is overseen by expert and qualified personnel. Unlike The Edge Gym in the Arena, this high performance gym has reserved access exclusively for the use of teams and interested groups and must be booked in advance. Booking can be made as a once off or on a long term basis. Teams are more than welcome to provide their own strength and conditioning coaches or we can provide one for you at an additional cost. WIT Arena’s High Performance Gym provides unique facilities to the sports and leisure culture in the South East of Ireland.